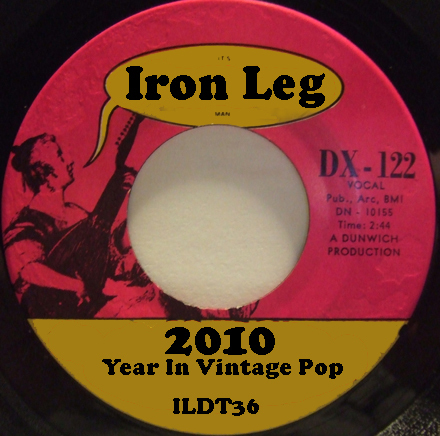 ILDT#36 – 2010 Year In Vintage Pop b/w Iron Leg is Back! Yeah, not all that exciting, but I had to say something. The past few weeks – usually while digging for, or recording records – I’d been thinking a lot about getting the old metaphysical crowbar and jamming Iron Leg back into my schedule. I don’t think I’ll be back to the twice-weekly rhythm that I had been working, but once a week with the occasional mix thrown in seemed perfectly reasonable, so here we are. Even though my main musical focus happens to be funk and soul (this, the sixteen cornered beast), I have a taste for lots of other things, mos’specially the sounds of 60s pop, garage and psychedelia, thus, this bloggy type thing here. When I instituted the temporary shutdown a few months back, I had a bunch of stuff backlogged and ready to go, and now, thanks to the fact that I always have time for digging (right up there with eating and sleeping) I now have more groovy stuff that I’d like to share with you good folks, including a couple of longtime want list items (now acquired), new discoveries and the like. So, starting next week, with the dawn of twenty-eleven, Iron Leg will be back in beez-ness. On second thought, it’s kind of back in business now, but since this mix is composed entirely of previously shared material (swept from the floors of the massive Funky16Corners/Iron Leg blogging complex), we can say that next week will signal the arrival of new stuff. That said, the playlist of the mix in question would seem to indicate that 2010 was in fact an excellent year, bringing many groovy things from my record box to your ears, with the fuzzy garage, the happy pop and the dreamy psychedelics, all stirred together into one big, groaning Little Rascals cake of wonderfulness. So, pull down the ones and zeros (there’s a similar, soulfully inclined mix over at Funky16Corners), give it all a listen and hang in there. NOTE: There is no accompanying zip file since all of these tracks have appeared here individually in the past year. PS Make sure to head over to Funky16Corners for a year end funk and soul mix.